From Left to Right: Christina, Jason Saki, Steve & Millie the Cosplay Parents, Laura & Jim Johnston, and Nikki Skelton. Photo by Todd Pickering. Throughout the year there are so many unofficial events that really impact the attendance on the parks. When you are planning a trip to the Disneyland Resort it is best to pick a time that isn't busy so you can ride more, see more, and do more. For example, the month of October used to be slow, but now that Halloweentime has become so popular you can count on that month being quite busy. It seems like a lot of people spend the holiday break and new year looking into a trip so here are some tips and suggestions for avoiding (or coordinating) a trip with days such as Dapper Days in mind. 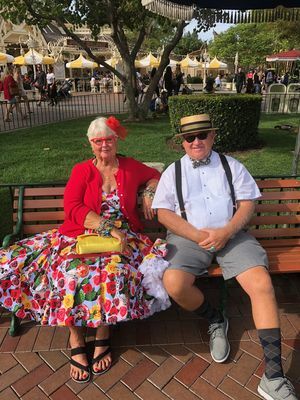 Since Dapper Days has just passed and the pictures are so fantastic, let's use it as an example of how to plan your trip around these events. 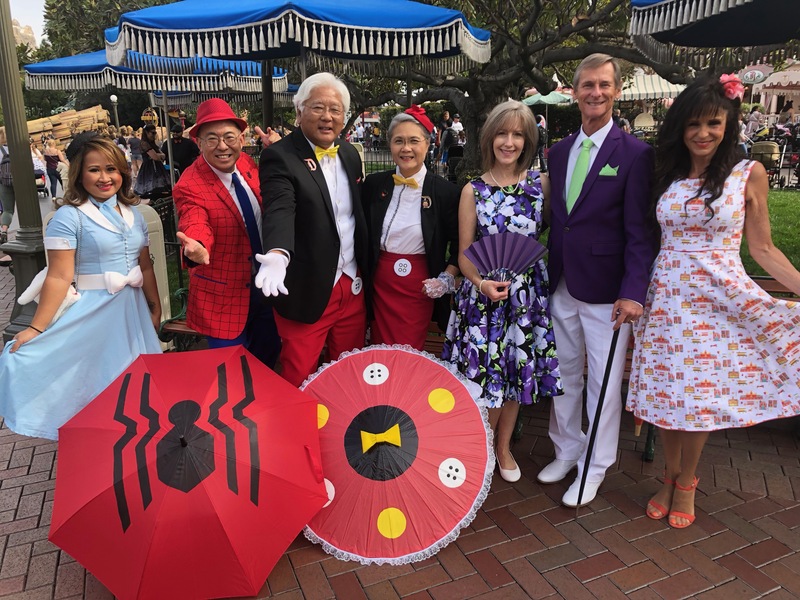 Dapper Days is an unofficial event that takes place twice a year at the Disneyland Resort. There is one in the spring and one in the autumn. This year we attended both of them for the first time. 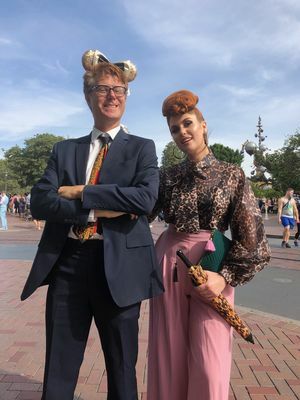 You can check out more about this event by going to the Dapper Day website. The Author with Doris Mayday. Photo by Amber Knight. If you are a seasoned visitor to the resort and looking for added fun then choosing to pack a gorgeous frock or a natty suit may be just the thing for you. 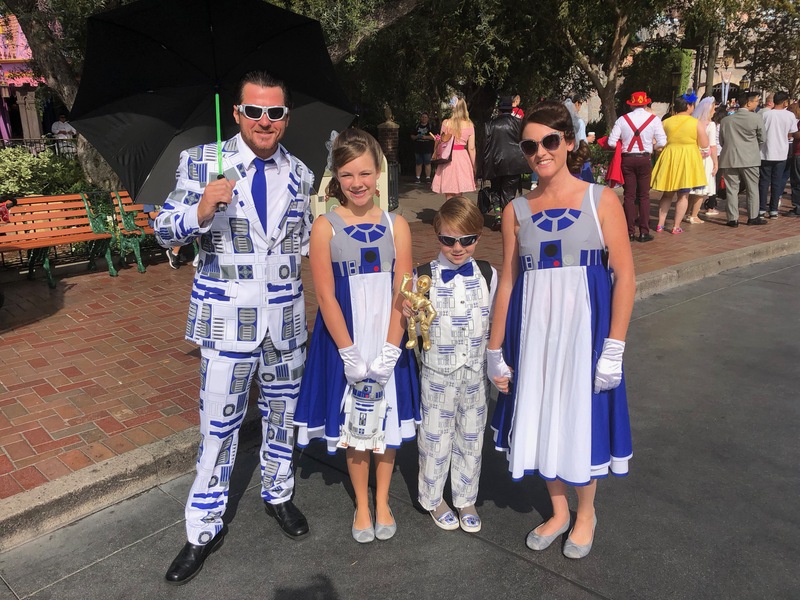 If your idea of touring the parks in formal wear sounds daunting, make an evening reservation at a restaurant like Ralph Brennan's Jazz Kitchen in Downtown Disney, Napa Rose in the Grand Californian Hotel, or even Carthay Circle in Disney California Adventure Park and change into your dressy clothes after a break from park touring. Strolling after dinner in the park dressed up can be fun and even romantic. Barbara and Mike Reeves grab a bench and enjoy people-watching. Photo by Todd Pickering. There is nothing like an event such as Dapper Days to loosen people up. I don't think there is a more convivial time to go to the parks. People are so happy to pose for pictures, and dressing up makes people especially friendly. People-watching has never been better, and it truly gives you a feeling of what it was like on opening day. In the 1950s, ladies would be in high heels and gloves, while gentlemen would never be caught dead without a dashing hat, a neatly pressed suit of clothes, and a handsome necktie. You truly feel like Walt could waltz by any minute and clap you on the back asking you if you are having a good day. Sigh. 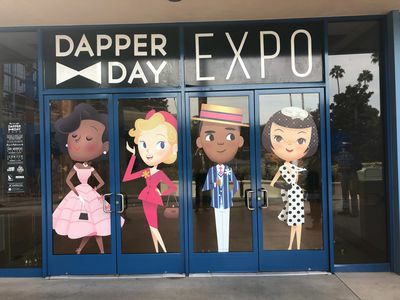 Dapper Day Expo over at the Disneyland Hotel. Photo by Todd Pickering. Many events have an Expo Hall set up on one of the properties at or near the Disneyland Resort. This year Dapper Days in the autumn had an Expo at the Disneyland Hotel. It cost ten dollars, and tickets could be purchased ahead of time. There are a lot of vendors and bands playing throughout the day. Getting out of the parks for a couple of hours can be relaxing, and strolling through the hotel properties is still pretty magical. And for all the crowds they may draw away from the parks the amount of people present will still keep the queues long and restaurants and bars full. 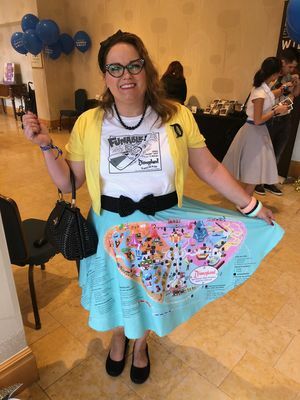 She had this print made onto a skirt. Check her out on Instagram @desperatemousewife. Photo by Todd Pickering. Official events can impact the park also, such as the beginning of Food & Wine Festival or a summer promotion like Pixar Fest always get locals curious to see what's new so going on the second or third week may be a good idea. If you end up in the parks make sure to use Fastpass, and when traveling from afar it is always key to book some reservations at restaurants to avoid the lines and wait times. The Corwin Family was seen on Dapper Days, but are also ready for May the Fourth Be With You! Photo by Todd Pickering. Always use MousePlanet's guide to events throughout the year at the Disneyland Resort when planning a vacation. Just scroll down to the bottom of the weekly update, which appears on Monday and you can see the latest listings of all events. By using the archives you can get a good idea when events were held last year. There may be more added every year and rest assured we will have that info. We try and also put links to the web sites so you can also research the events. 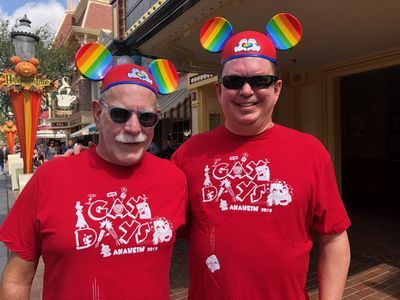 For example Gay Days attendees go to Disneyland on Saturday and Disney California Adventure on Sunday. The Saturday really impacts the park. We have attended this event and followed the opposite path and avoided all meet and greets but have also attended and shown up for the meet and greets and joined in on the festivities. We have heard from many locals that have donned red shirts and participated for Gay Days or put on a suit and a tie for Dapper Days and had a grand old time. So don't be afraid to join in on the parties. Bruce and Andy pose at Gay Days which is always the first weekend in October. Photo by Todd Pickering.